Most semi-arid regions suffer severe rainfall erosion, often more than in the humid tropics, because the rain has a high erosive capacity which is more damaging because, of the reduced vegetative protection Past erosion in Mediterranean lands is well documented by Lowdermilk (1975) and a recent survey shows that the position continues to deteriorate. Some examples are Morocco, with 40 percent of the country's total land area exposed to erosion; Turkey with more than 50 percent damaged; Greece with 21 percent suffering moderate erosion and 46 percent severe erosion damage. The non-Mediterranean semi-arid regions also report rainfall erosion problems; in North America, the USA and Mexico; in South America, the north-east corner of Brazil, and much of the south-east of the continent; in Africa, the Sahel and the south-west (e.g. Botswana); then there is a huge belt stretching east from Africa through Turkey, Iraq, Iran, and Afghanistan, with one arm extending into eastern USSR and China, and the other arm south of the Himalaya through Pakistan to India. In Australia, most of the states have severe rainfall erosion problems in areas of low rainfall. 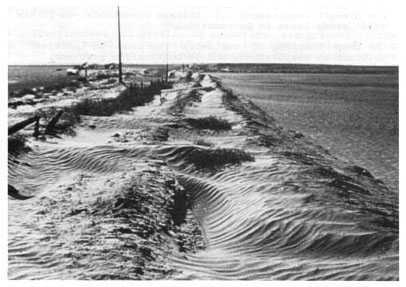 Wind erosion can be serious in the temperate semi-arid regions and examples are the central steppes of Asia (eastern USSR, Mongolia, and China); in North America the north-western States of the USA, and the central prairies of Canada. In the semi-arid tropics the picture varies. Some countries surrounding the arid Sahara report desertification with increasing wind erosion. On the other hand, the opinion has been expressed that in many cases the semi-arid regions receive more soil blown by the wind from deserts than they lose from rainfall erosion. This view is supported by the existence of vast areas of wind-deposited loess soil in semi-arid regions. The only thing common to all the semi-arid regions is low rainfall. Everything else varies so much that it is not practical to think in terms of searching for universal solutions. They may have temperate or tropical climates, rainfall in summer or winter seasons, and hence totally different forms of agriculture. Even when the climate is similar there are other significant differences as shown when Charreau (1977) considered the possibilities of transferring the technology developed at ICRISAT in India to countries in West Africa. The main features of the climate are the same in both regions: a short rainy season, intensive rainfall interspersed with unpredictable droughts, and highly variable rainfall during the wet season. However, in India the duration of the rainy season is longer, and the curve of potential evapotranspiration is unimodal, while it is bimodal in West Africa. Non-typical periods without rain are most likely to occur in the middle of the rainy season in India, but at the beginning and the end of the season in West Africa. Both regions have, as their main soils, red alfisols and black vertisols, but there are differences which have important implications for cropping, cultivation, drainage, and fertility status. In addition there are major sociological differences, particularly the density of population which in India is very high at 200 inhabitants per km2 compared to 10-60 per km2 in semi-arid West Africa. This leads to a very different approach to agricultural production. In West Africa the objective is to maximize production per worker, whereas in India it is more important to maximize the return per unit of land. There are also differences in the style of land use. In Asia families have farmed the same land for generations; in Africa many people are nomadic or seasonally migrant. Previously the emphasis of agricultural research and development has been on making the best use of good soils and good climates and little attention was given to marginal environments. One result of this uneven spread of effort is a lack of information about the less favoured semi-arid areas. This shows up in every technical discipline. In the semi-arid regions there are fewer soil surveys to show what is available, and less research on the physical and chemical properties of soils to show their capablities and problems. There are fewer agrometeorological stations, and less analyses of the results, although because of the variability there really should be more of both. There has been less research on crops. Most countries with a combination of humid and arid conditions have concentrated on the humid areas, sensibly because this is likely to give the quickest and most cost-effective return. Major international research for dry areas is recent, with the establishment of the International Crops Research Institute for the Semi-Arid Tropics (ICRISAT) in 1972 and the International Centre For Agricultural Research in the Dry Areas (ICARDA) in 1977. Selecting or breeding cultivars for particular semi-arid climates shows promise, but has a long way to go (Hall et al. 1979). · cultural and ethnic boundaries may be different from the political boundaries. A combination of lack of interest, low research commitment, and the complexities of the problem results in a shortage of technology which can be applied to improving agriculture in semi-arid regions. Jones points out that, in Africa, studies of water management techniques such as tillage and tied-ridging have several times shown great promise, but have been too brief, or too local, or restricted to experiment stations, and as a result they "generate neither the depth and breadth of understanding of the technique (and the limitations imposed on it by soil, implements, econo- mics, etc.) nor the impetus and general interest that might sustain it through a long programme of wider testing, adjustment, and retesting under practical farming conditions" (Jones 1984). Research in semi-arid regions needs a long time span to reduce the effect of seasonal variations, and coverage over a wide area to reduce the effect of local variations. Another difficulty is putting technology into widespread operation after it has been developed and tested. In India, agricultural production is unstable in over three-quarters of the agricultural areas because of inadequate or erratic rainfall. The Drought-prone Areas Programme has made considerable progress over twenty years, but there is still a gap between the research results and practical application to farming (Johl 1981). Improved technology for the vertisols, developed at ICRISAT, has been tested and validated, and is being increasingly taken up. But to get it applied on the whole 5 million hectares of vertisols within 20 years would require a growth rate of 43 percent per year in the rate of adoption (ICRISAT 1986). An important reason for the poor adoption of new techniques is the inability of the subsistence farmer to take risks. The essence of farming is trying to improve the odds in the gamble against weather, pest, and disease. The peasant has no risk capital to gamble with, so his whole strategy is geared to safety. He would rather use a low-yielding variety which gives some yield every year than an improved variety which will give an increased yield most years, but none at all in the bad year. Even if the chance of an increased yield is nine years out of ten, it is still not an acceptable gamble for the small subsistence farmer. In the tenth year, the year of failure, his family will starve. It is neither stupidity nor lethargy when he sticks to his old variety, it is accepting the realities of life. Figure 2.1 illustrates this argument by comparing the yield of a local variety of a cereal and a hybrid high yielding variety. The point that the subsistence farmer cannot afford to take risks applies equally to many other possible changes which may be promising but uncertain. The human population of semi-arid regions is increasing like any other region as a result of natural increase, but there are other factors. There is a general migration from more densely settled areas, in some cases encouraged by national policies of land allocation or for improving produc- tion in the drier regions. It has also been suggested that the increase of settled agriculture in areas previously occupied by nomadic pastoralists has been accompanied by a higher growth rate among the settled population than the nomads. Increases in the livestock population are sufficiently well documented in many countries for us to be able to recognize a trend of steady increase, usually an upward exponential curve. Some examples are given in Section 7.1.1. One factor has been the success of veterinary science (referred to in Chapter 1), another is that the demand for meat products has risen dramatically in some countries, and a case in point is Nigeria. In some cases the development of water supplies has been another factor leading to more livestock, and more pressure on grazing, lands. An interesting example is the sheep population in Iraq as quoted by Thalen (1977), who suggests that a remarkable increase in the sheep population resulted from a combination of the introduction of mechanical equipment for drilling wells and the adoption of four-wheel-drive vehicles which greatly increased the accessibility of remote regions. The national herd was estimated at 4 to 5 million in the nineteen-thirties and rose to 10 or 11 million in the nineteen-sixties, leading to such overgrazing and degradation that the population fell back to 6 million in the early nineteen-seventies. Similar examples of over usage following improved water supplies are reported from the Sudan (Adams 1975) and from other countries in the Sahel (Franke and Chasin 1981). Increased pressure on the natural resources also leads to loss of flexibility. There are no reserves which can be called upon in the bad year. This applies at the scale of the individual farmer whose meagre reserves of food and grazing are soon used; it applies equally at the level of the village or tribe who in the past have traditionally held emergency grazing in reserve; it applies at the national level as grain stocks are depleted, and at the regional level when it is no longer pos- sible to use the safety valve of major movement of livestock. Examples of traditional safety valves are Botswana, where a poor season is the occas- ion for the large movement of stock out to the east of the country, and the Sahel where there is a general movement southward, in both cases with a reverse migration as conditions improve. In western Sudan the effect of recent droughts has not been so severe because the people were able to move south with their livestock to wetter areas which are only sparsely populated. Political events may provide restraints on traditional movements of this nature by restricting the movement across national frontiers. On the other hand, political troubles can also lead to problems caused by the movement of refugees. The general trend of change in land use has been quantified in the case of Mali. Between 1952 and 1975 savanna grazing went down from 89 to 63 percent of the farmed land while cropping rose from 6.6 to 11.1 percent. At the same time degraded land increased from 4 to 26 percent (ILCA 1980). To summarize, there is a wide range of evidence to show that the natural resources of the semi-arid regions are suffering increasing damage as they face increasing demands and increasing pressures. The two key features which adversely affect agriculture are the low amounts of rainfall and the unreliability. Adding to the problem, the two are linked, in that the variability becomes greater as the mean rainfall decreases. Data from western Asia and North Africa show this in Figure 2.2. The low quantities of rainfall lead to several contraints. Cropping may not be possible at all, or possible only with the use of special techniques such as fallows, or furrows to collect more rain. The range of suitable species will be limited, and in the semi-arid tropics with summer rainfall it is usual to grow maize where the rainfall permits, then sorghum where the rain is not sufficient for maize, and millet where the rain is not sufficient for sorghum. Farming strategy must therefore be directed towards minimizing any loss or wastage of rainfall. Areas of low annual rainfall may still receive heavy individual storms causing flood and erosion. Table 2.1 from Rainey (1977) shows the large differences between mean annual rainfall and figures for the exceptional wettest month. 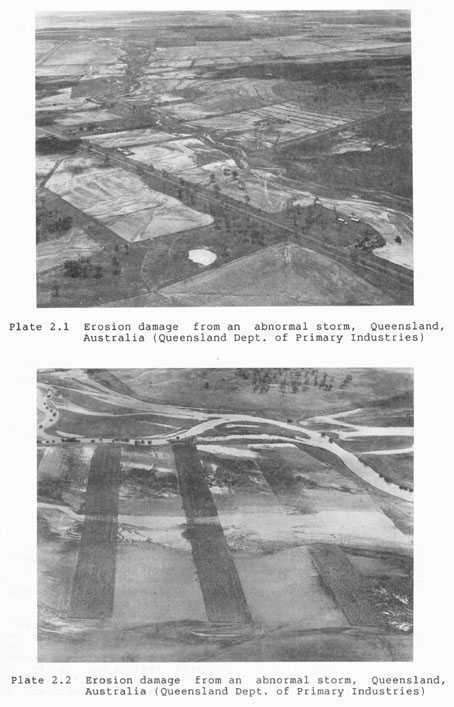 Examples of devastating floods and erosion resulting from abnormal storms in Queensland, Australia, are shown in Plates 2.1 and 2.2. There is a general association between mean annual rainfall and the annual erosive power, but this results mainly from the fact that a higher annual rainfall includes a greater number of storms, not that the indivi- dual storms are more severe. The high-intensity, short-duration convective rainfall dominant in the tropical semi-arid regions has fairly stable intensity/duration relationships, and these are independent of the long- term rainfall at a particular location. For example, an important parameter for the prediction of erosion is the maximum fall in a 30-minute period and this has been shown to be independent of location and of mean annual rainfall both in Mediterranean lands and the semi-arid tropics (FAO 1981, p 13). On the other hand, some areas experience low-intensity frontal-type rains, usually in the winter season. Where most precipitation occurs in winter, as in Jordan and in the Negev, low-intensity rainfall may represent the greater part of annual rainfall, and rainfall erosion is generally less in these circumstances, although sensational floods can still occur. Source: WMO (1967) Climatological normals for 1931-60. 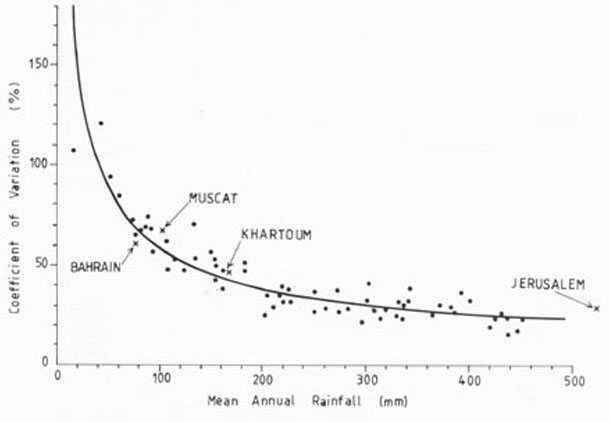 The increasing variability with increasing dryness was shown in Figure 2.2, and another way of illustrating it is to look at the standard deviation of annual rainfall. In temperate climates, in nineteen years out of twenty, annual rainfall is between 75 and 125 percent of the mean. In the semi-arid tropics, at mean annual rainfalls of 200-300 mm, the rainfall in nineteen years out of twenty typically ranges from 40 to 200 percent of the mean, and for annual rainfalls of 100 mm the range widens and is 30 to 350 percent of the mean (FAO 1981, p 13). There is usually a considerable positive skewness of the distribu- tion of annual point rainfalls. This means that there are more annual values below the mean than above it, and the modal value is less than the median value, and both the mode and the median are less than the mean (FAO 1981). There is also the question of short-term spatial variation which is common when the rainfall is mainly of the convective small-cell type. For example, Sharon (1972) showed that in Israel the rain may be in small cells of up to 5 km diameter, so that in a watershed of a few hundred km2 only 20 percent of the area may receive rain. Over the longer term, variation of the rainfall regime, within an area of generally similar rainfall, can be sufficient to influence crop management, as shown by a study of three sites in Syria by Keatinge et al. (1985), and at six sites in Botswana by Dennett and Rodgers (1986). In other words, the general unreliability of rainfall from year to year is compounded by the variations from place to place and from storm to storm. Forecasting or prediction is therefore also difficult. Modern statistical techniques allow the calculation of the probability of events important to agriculture such as the occurrence of planting rains, or of drought spells at particular times during the season. But these are essentially strategic tools, helpful to governments for planning policies, or offering guidance on the probability of being able to carry out crop management practices at particular times. There are promising possibil- ities of providing seasonal forecasts for a region, based on links between large-scale features of the atmospheric circulation and rainfall, for example a study of Fiji by Dennett et al. (1978), but such forecasts can only be general and will show considerable local variability. What the farmer really needs is advice to help him in short-term tactical decisions, but this is more difficult. Studies by Dennett et al. (1983) found no dependence between rainfall at different times within the rainy season; that is, events early in the season do not provide any guide on what is likely to happen later in the season. On the other hand, in Kenya, Stewart and Hash (1982) were able to assign a rainy season into one of three categories of predicted total rainfall, according to the time and early amount of the early rains, and to do this sufficiently early to modify management decisions. 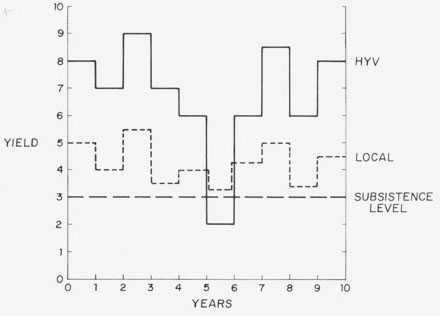 But a similar analysis of Botswana rainfall data revealed no linkage between early rainfall and seasonal total (Sinclair 1985). There is thus some opportunity for tactical mid-season changes. In another example, Rainey (1977) observes that nomadic graziers respond quickly and effectively to seasonal variations in rainfall by moving herds to where their bush telegraph intelligence system tells them that rain has fallen. Mid-season changes of cropping patterns are more difficult. Theoretically it should be possible to plant a preferred long duration variety if the rains start on time, but switch to a short duration crop if the rains are late. There are some cases of this technique being used, for example in India and in Swaziland, but there are serious logistic problems of maintaining duplicate seed stocks and of distributing them at the required time. Extremes of temperature can cause problems at both ends of the scale. The wheat growing areas of Kazakhstan, USSR, are only free from frost for 100-120 days, and cropping is only made possible by day and night ploughing, planting as early as possible, and harvesting in autumn before the crop is fully mature Botswana in Southern Africa experiences surface temperatures so high that germination can be inhibited, and it is possible that one reason for reduced yields after ridging is an increased soil temperature in the ridges. Wind erosion is likely to be a threat whenever soil dryness and wind occur together. This combination is frequent in the semi-arid tropics, and can also occur in temperate climates when seasonal dryness coincides with seasonal winds. An example from the Columbia Basin Irrigation Project in Washington State, USA, in early spring, is shown in Plate 2.3. Hot dry winds have three main effects. They reduce the effective- ness of rainfall by evaporation from the soil surface; they increase evapotranspiration from the leaf area of crops, increasing the risk of moisture stress; and the surface of stored water suffers from high evaporation loss. The diversity of soils in semi-arid regions is immense, and two examples will serve to indicate the range of soils and soil-related problems. In a review of the soils of the semi-arid tropics, Kampen and Burford (1980) show that the semi-arid tropics are mainly in the developing countries of Africa (70 percent of the total) and south-east Asia (mostly in India). Latin America and Australia each contain about 10 percent. Eiqht soil orders are represented, of which alfisols and aridisols are more than half of the total. Alfisols are the largest order and cover about 32 percent of the African SAT and about 38 percent of the Asian SAT. Vertisols cover 6 percent of the total area but 25 percent of semi-arid India. Another example is Jones (1984), explaining the diversity of soils in the low rainfall areas of southern Africa, "the soils vary widely from very extensive areas of arenosols (sands and loamy sands) in Botswana, Zimbabwe and Mozambique, to smaller but potentially important areas of vertisols (heavy clays) scattered widely over the zone; and from highly leached and acid acrisols, ferralsols, and nitosols in Tanzania (mainly) to neutral, alkaline, and salt-affected soils in Botswana (fluvisols, solonchaks, and xerosols and solonetz)." · many semi-arid soils have low moisture-holding capacity, especially shallow or sandy soils. The shallow alfisols in India are an example. Water storage in the root zone may be limited by a) low intrinsic moisture-holding capacity of sandy soils and b) the limitation on root pro- liferation at depth by natural soil hardness. Management techniques to prevent run-off may cause ponding and over-wet conditions particularly at early stages of growth. Due to erratic rainfall and low storage, even com- plete infiltration early in the season may not avoid moisture stress later. Chemical soil problems include low fertility which may be inherent or caused by leaching or by past soil erosion. Breman and Vithol (1984) report that, in the Sahelian rangelands, the low fertility of soils, especially in nitrogen and phosphate, is often more of a limiting factor than low and irregular rainfall. Salinity and alkalinity are another major problem but outside the scope of this book. There are a number of specialized forms of erosion which are asso- ciated with excessively high erodibility and which are more frequent in semi-arid than in humid regions. Tunnel erosion or piping is one of these and often associated with badlands geomorphology (Bryan and Yair 1982). This may be associated with dispersing soils or soils with a calcium/sodium imbalance. 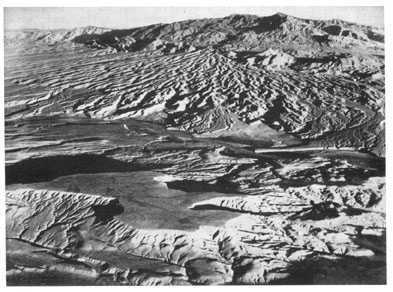 Geological erosion can be severe as a result of a combination of high erodibility, heavy storms, and poor vegetative cover, as in the example of Plate 2.4. All the problems of developing countries are present in the semiarid regions, but usually intensified by the low levels of production, which lead to little or no investment capacity on the farm, or low development of the infrastructure by government. The general picture is rather depressing with declining production and increasing degradation, but examples show that techniques exist to overcome the problem. i. In the semi-arid Pacific north-west of the USA, successful wheat production has been achieved on mean annual rainfall of 240 - 400 mm but this is mainly winter rainfall, and the system requires substantial inputs of machinery, capital, and fertilizer (Bolton 1977). · advanced training overseas for research and extension workers. In this case also there were substantial inputs but they consisted of training, research and extension, so the example is more relevant and applicable to developing countries. iii. In Australia, reasonable levels of yield are being maintained through the use of clover or medic rotations. The only fertilizer used is superphosphate at 60 to 100 kg/ha. Grazing of the legumes and stover has to be carefully controlled. This system has been successfully demonstrated in Libya, and has potential for other areas. iv. In summer rainfall areas there are promising developments of dry-land farming techniques coming from ICRISAT, although farmer acceptance is still limited. In many countries a serious constraint is the shortage of energy available for cultivation. In the third world, the poorest farmers can only dream of the day when they may be able to own a pair of oxen, and millions more have some animals but not enough to work their land effectively. In summer rainfall areas there is always the problem that in spring, when there is the greatest need for draught power, and ploughing has the highest draught requirement, the animals are in poor condition after coming through a hard dry winter. It is common in Africa to find that after the rains start, the animals have to be fed up on the new grass for a month to get them into condition, although early planting is one of the most basic requirements for good crop production. In other countries the critical shortage may be manpower. Migration of adult male labour to more rewarding occupations in towns or in neighbouring countries has a serious effect on agriculture in many countries. In Africa, the gold mines and industry of South Africa have drawn away so much labour from neighbouring Lesotho and Swaziland that crop production is materially reduced. Another recent market for unskilled labour has sprung up in the oil-rich Middle East. Migration from densely populated countries like India and Pakistan does not affect their agriculture, but in other cases there are problems. In the Yemen Arab Republic a well-developed system of terracing is collapsing because of inadequate labour to maintain it (Vogel 1985). A similar situation exists in several countries of North Africa where migration to the labour markets of Europe is adversely affecting agriculture. There are also all the usual problems of inadequate inputs. Fertilizer and improved seed are either not available or too expensive for the subsistence farmer. He has inadequate investment capital, and coopera- tives and sources of credit are usually undeveloped, and particularly difficult for semi-nomadic peoples. There are also the social problems arising from the difficulty of effectively managing communal grazing land; and the reluctance to make investments of cash or labour in land which is held on a temporary or insecure lease. The infrastructure is usually less well developed in semi-arid regions because there has been both less demand for roads, water supplies, and marketing outlets, and also because the low level of produc- tivity does not justify development of these facilities. There are usually problems of distribution of seed, chemicals, and fertilizer, and these have recently been thrown into prominence by the inability to distribute food provided by aid agencies in countries suffering famine. While most governments have policies directed towards the improvement and development of agriculture, these are not always pursued as vigorously as they might be. It has been suggested that in several countries in Africa the government policy of reducing the national herd to relieve the pressure on degrading grazing land is not happening because so many of the stock are in very large herds owned by powerful individuals. Another difficulty for governments is how to reconcile the political wish to hold down the cost of staple foods and yet at the same time pay a fair price to the farmers. At the level of international relations, it is alarming that there are so many political conflicts in semi-arid regions where the struggle against nature is bad enough without being made worse by further conflict.